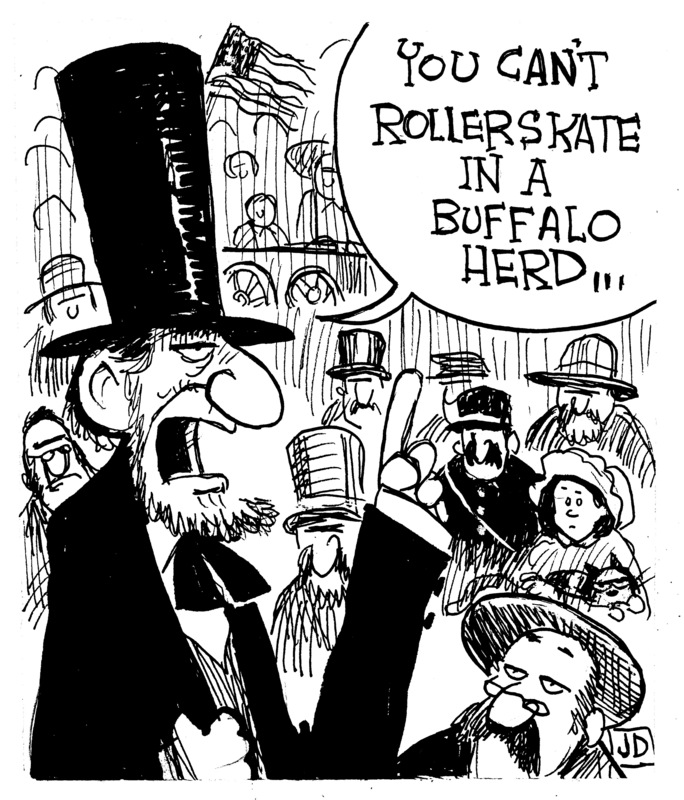 Obviously, Roger Miller was cribbing his lyrics from Honest Abe. 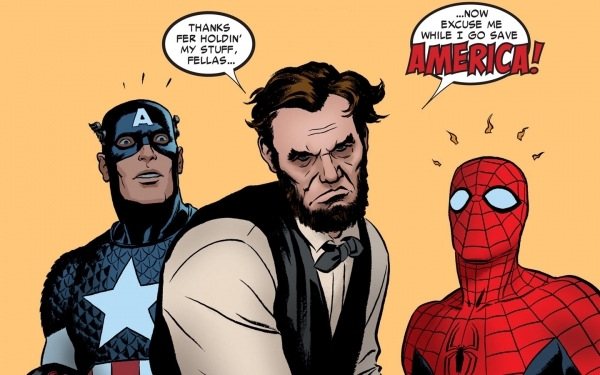 “Dang Me” came from the notes Lincoln threw out for the Gettysburg Address, I hear. Awesome illustration by John Deering. See if you can spot Luke and me. Every once in a while, there will be a quote on the Voices or editorial pages that will rile a few people up. A few years back it was a letter with a selection of Thomas Jefferson quotes, some of which weren’t actually from the philosopher of Monticello (the one pronounced with a musical instrument in the name rather than our state’s less-pompous pronunciation). That error, which was before I became the Voices editor but while I was working on the page, made me more vigilant. Recently a letter on the Voices page credited P.T. Barnum with the famous “You can fool …” aphorism. A few people wrote in or commented that, no, it was Abraham Lincoln. So who’s right? Image found on Hero Complex blog on Los Angeles Times. P.T. Barnum and Abraham Lincoln are both credited with having said some form of “You can fool all the people some of the time and some of the people all the time, but you cannot fool all the people all the time.” To say that either is credited with saying it would be technically correct. However, historians say, neither was likely to have actually said it. Lincoln, of course, is most often associated with the quote, but that attribution came after his death, most prominently from the speeches of Prohibitionists in the 1880s, often with a recollection of a speech given in Clinton, Ill., of which no text survives. 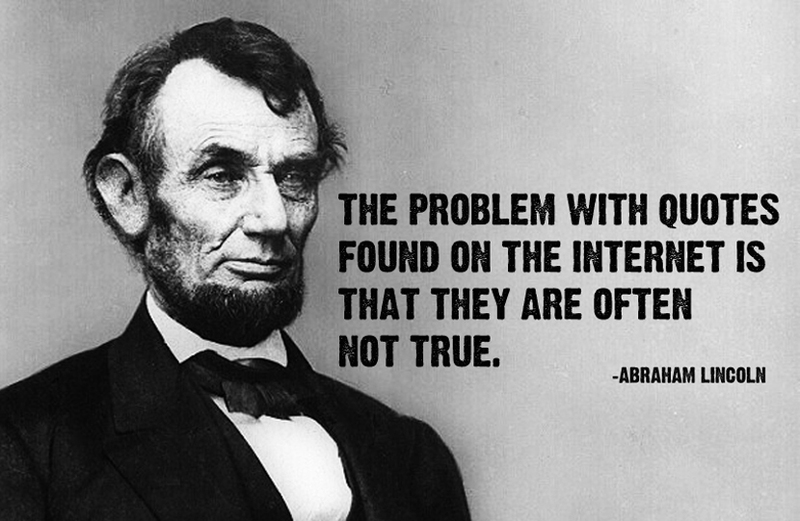 The earliest attribution to Lincoln that Quote Investigator was able to find was from a March 1886 interview with Prohibitionist Fred F. Wheeler in the Albany Times. 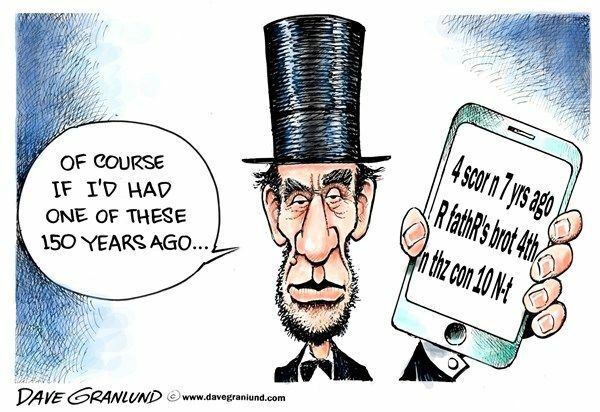 Unless my math is realllllllly wrong, that’d be more than 20 years after Lincoln’s assassination, and I saw no mention of a séance with his spirit. Thank God there was no texting then. Editorial cartoon by Dave Granlund. 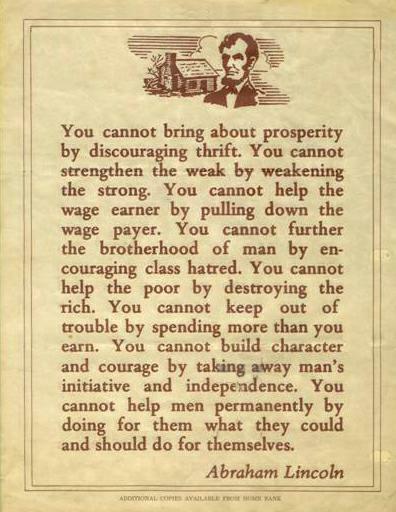 That’s far from the only witticism attributed to Lincoln over the years, and probably far from the last. One of the most famous of these is “The 10 Cannots,” actually from William J.H. Boetker in 1916, though the misattribution didn’t happen until 1942 in a misprinted leaflet, with attributions for Lincoln and Boetker switched. Ronald Reagan, among others, helped spread the mistake. Reagan is just one of the presidents fooled by a fake Lincoln quote. In 2010, Barack Obama, in a speech to Democratic lawmakers, quoted Lincoln: “I am not bound to win, but I am bound to be true. I’m not bound to succeed, but I’m bound to live up to what light I have.” (And yep, Reagan had used that quote as well.) 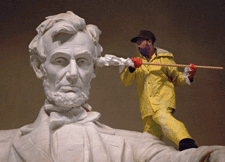 However, Lincoln didn’t say that either, and Claremont McKenna College Professor John Pitney Jr. quickly outed its spuriousness. Pitney told the Abraham Lincoln Observer blog that he’d tracked the quote attributed to Lincoln back to at least 1905 in The Baptist Teacher. Where it originated … who knows? Also not a real Lincoln quote. I think. Another quotation, also sometimes attributed to Mark Twain and Confucius, is “Better to remain silent and be thought a fool than to speak and remove all doubt.” The Yale Book of Quotations found that Golden Book Magazine attributed it to Lincoln in 1931, well after he’d shuffled off this mortal coil. Quote Investigator noted little evidence that any of the above originated or used the saying, instead naming Maurice Switzer, author of 1907’s Mrs. Goose, Her Book, as most likely to have coined the phrase. 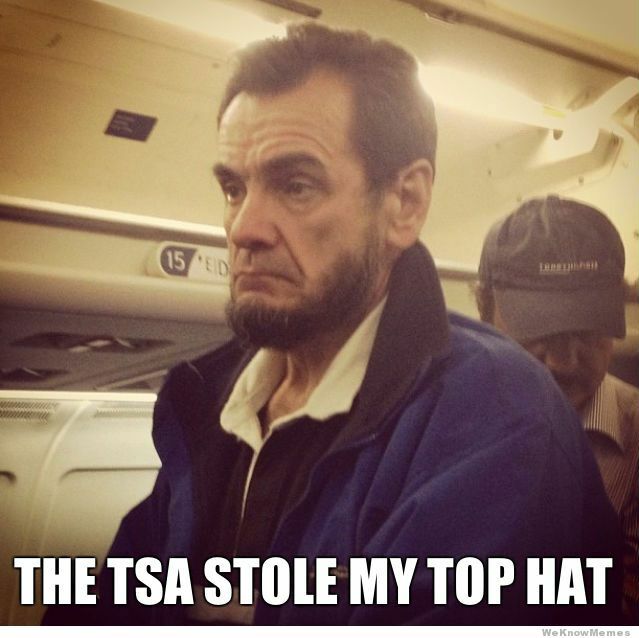 I’m pretty sure Lincoln didn’t say, “Don’t put that Q-Tip in your ear, dude.” I could be wrong, though. But why do we believe stories that are apocryphal (meaning of doubtful authenticity)? It could be as simple as tradition, which is what’s happened with a lot of Lincoln “quotes.” If it’s said enough, people begin to believe it’s true (which explains a lot about the current election season). However, when historical organizations exist just to protect the truth of the writings of past presidents and other notables, it’s easier than ever to find out what was said or not said. And then there are the believable quotes and stories that are just too funny to forget. Given Winston Churchill’s storied irascible nature, it’s hard to believe that his exchanges with Lady Astor (such as “If I were your wife, I’d put poison in your drink,” answered by, “Madam, if I were your husband, I’d drink it.”) weren’t true. Even if we really, really want them to be. Wait … he didn’t say it? Never mind. Those who know me very well know how much I love Mel Brooks’ movies, especially Young Frankenstein. With the death of Gene Wilder on Monday, we’ve lost yet another bright light in the world of comedy. He now joins other favorites from that film, including Peter Boyle, Madeline Kahn and Marty Feldman, in a land where the laughter never stops. And, like my mom, Mel Brooks is not allowed to die. Ever.